155 William Drive Spring City, TN. | MLS# 1036107 | Fantastic Lake Front Properties in East Tennessee Take a Tour with Sail Away. Specializing in Lake Front Homes in Watts Bar, Ft Loudon Lake, Tellico Lake, Melton Hill Lake, and More. Dreaming of living on the lake? 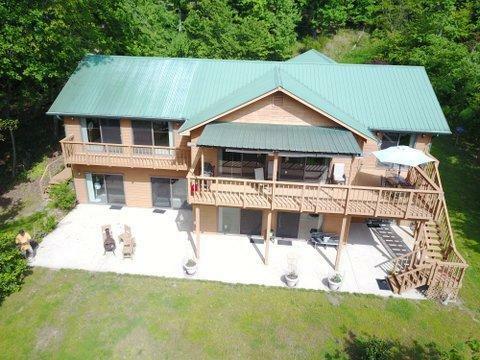 This Main Channel home on the shores of Watts Bar Lake is what you are dreaming of. Boasting over 4000 sqft of Open living space with the living area acting as the central gathering place. The entire space has an abundance of natural light and is surrounded with Anderson Window and sliding/French doors which open to the deck overlooking the Main channel. Lake Views from everywhere, all four bedrooms have access to the exterior with large views of the lake. This home is complimented with a large Master Suite situated perfectly in the home. A level lot leads to the dock with a covered boatlift. Swim off the dock or from the beach in this fantastic dream come true. Large driveway and parking leading up to an attached three car garage.